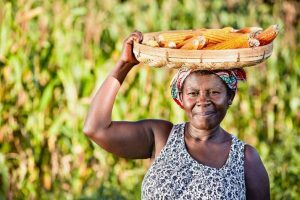 A publication from the Global Crop Diversity Trust delves into the science behind Provitamin A maize, a biofortified maize variety with the power to reduce malnutrition and vitamin A deficiency. Vitamin A deficiency is the leading cause of preventable blindness in children, and approximately one third of children under 5 are at risk. Simply substituting Vitamin A maize for conventional maize can result in a 50 percent increase in Vitamin A consumption in maize-eating regions. Provitamin A maize was developed by the CGIAR Research Program on Maize (MAIZE), the International Maize and Wheat Improvement Center (CIMMYT), the International Institute for Tropical Agriculture (IITA) and HarvestPlus. The article, part of the Global Crop Diversity Trust’s “Science Brief” series, explains how the biofortified variety was created using conventional breeding techniques, as well as the crucial role of maize genetic diversity and genebanks in its development.